Manchester City's defenders overshadowed their attacking team-mates to deliver in Gameweek 27, as Pep Guardiola's side claimed back-to-back clean sheets while scoring only twice. Meanwhile, Stoke City's resistance at the Etihad Stadium, coupled with their shutout against Middlesbrough at the weekend, earned two if their backline Dream Team call-ups. The Potters goalkeeper recorded back-to-back shutouts against Middlesbrough and Man City to claim his third Dream Team call-up of the season. Grant has averaged 4.2 points per match since being handed his first start back in Gameweek 6 and is the top-ranked FPL goalkeeper for points per million (21.8). A Dream Team debutant, the Stoke left-back earned two bonus points along with a pair of clean sheets to deliver 14 points for his 8.2% owners. Pieters has returned three shutouts and six bonus points over his last six Gameweek appearances. 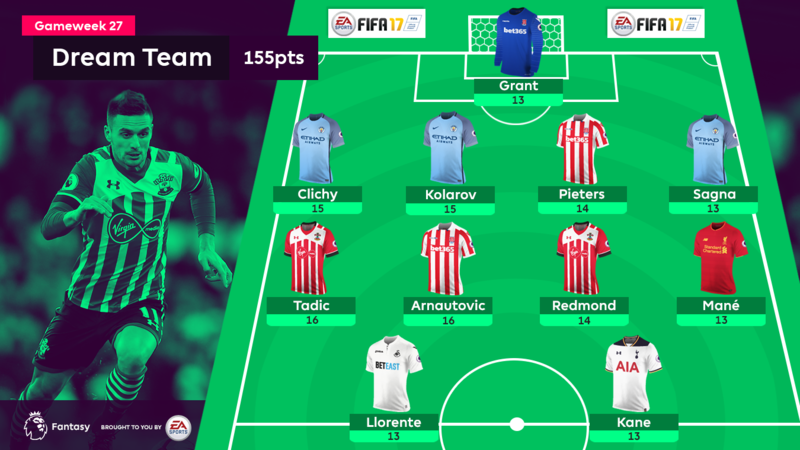 One of three Manchester City defenders among the Gameweek XI, Kolarov produced two clean sheets and three bonus points to claim a second Dream Team appearance. He has started 18 of their last 19 league matches, earning a shutout in four of his previous five. The Frenchman mirrored Kolarov’s output to bring home a 15-point haul for his 1.1% FPL owners. Clichy has produced 30 points over his last six outings as Guardiola’s preferred left-back. Sagna received his first Dream Team call-up of the season thanks to a 13-point haul. He looks to have established himself as favourite for the right-back berth and has earned a clean sheet in each of his last four Gameweek starts. Despite failing to recover from illness in time for the midweek trip to Manchester City, the winger’s 16 points was more than any player in the Stoke or Manchester City ranks. 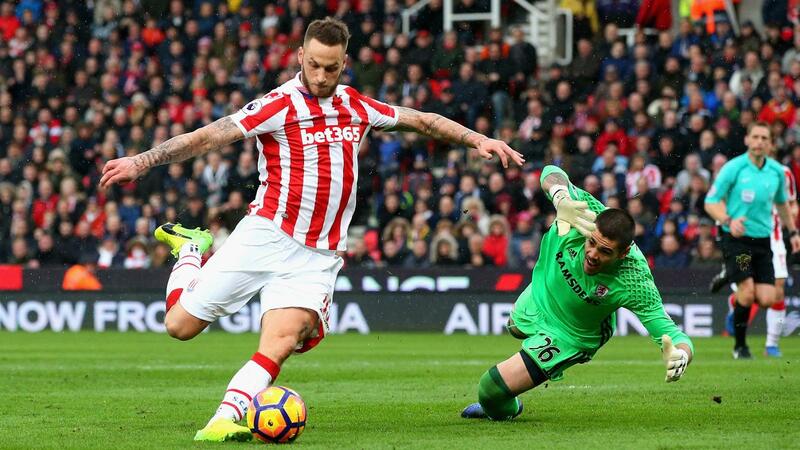 Having scored twice to collect maximum bonus in a 2-0 weekend win over Middlesbrough, Arnautovic has produced four goals and an assist in his last six Gameweek outings. A goal and two assists in the Saints’ 4-3 win at Watford helped the playmaker to his first Dream Team call-up of the season. Tadic has thrived in a new central-support role since the arrival of striker Manolo Gabbiadini (£6.8m), producing 22 FPL points in two appearances alongside the Italian. Another Dream Team debutant, Redmond’s Vicarage Road double ended a run of 15 Gameweek appearances without a goal. A 14-point tally was the winger’s first double-digit haul since the opening weekend, suggesting that he offers a value route into a Saints attack set to play 12 matches over the final 10 Gameweeks. A goal and assist at home to Arsenal helped the Liverpool winger to a 13-point return as he climbed to fourth in the FPL midfield standings. Mane is the most popular midfield recruit ahead of a weekend home encounter with Burnley, with more than 138,000 FPL managers acquiring his services. The Spaniard receives his fourth Dream Team call-up thanks to two headed goals and three bonus points in the Swans' victory over Burnley. Scoring five times in his last six Gameweek appearances, Llorente is the top transfer target for FPL managers ahead of a trip to Hull City. A brace at home to Everton took Kane’s tally to 12 goals and three assists in his last 10 Gameweeks. Averaging 6.9 points per match - second only to Southampton's Gabbiadini among forwards - he seems destined to be a key member of our three-man frontlines for the season run-in.